While I like to use products from myriad brands -- and usually, my apartment and desk look like miniature versions of Sephora -- once in awhile, I begin to use a host of products from one specific company. 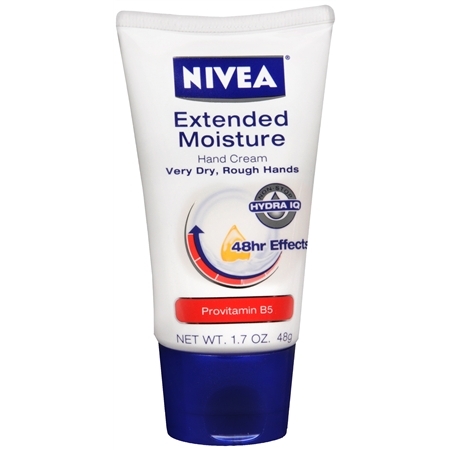 As of late, that company has been Nivea. I was lucky enough to receive a few of their products in recent weeks, and I'm here to tell you that they've completely changed the look and feel of my skin from head to toe. Here are my favorites, in a segment I'm calling Nivea Appreciation Day. You know that tight, itchy feeling your skin gets when it's drier than the Sahara? I've found a way to banish it for good. My legs and elbows have been looking extremely ashy recently, and nothing I've tried worked ... until now. A week applying this lotion and it's like I have brand new skin! I really can't believe the difference. I actually started to feel a change within the first day of application -- gone were the horrible itching and discomfort. And now? You'd never know I EVER had dry skin to begin with! It takes a lot to pull me away from my beloved Lip Smackers, but this lip balm definitely gives them a run for their money. I've been keeping at my office desk, and it just adds a little something special to my workday. It smells divine and glides right onto lips without feeling sticky, tacky or waxy. Plus, it lasts for hours -- no matter how much water or Diet Coke I drink! One of my favorite types of shower gels? One that includes moisturizing and exfoliating beads. So it's no wonder that I was immediately drawn to this iteration, which contains moisturizing pearls made with golden sunflower oil. Not to mention it's honeydew scented, which is only one of my favorite scents of all time! If I haven't made it clear by now, my body has been extremely dry this winter ... and now spring. (Really, where are the warmer temperatures already?) In any case, my hands have taken quite a beating, becoming increasingly dry and cracked as the weather flip flops around. Enter this hand cream, with a lush formula which sinks into skin immediately and provides immediate nourishment and relief.